Book Astrology Ads in Indian Newspapers Instantly Online! 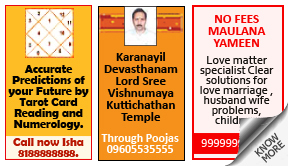 Why Book Astrology Ad in Newspapers? Astrology is a science that controls a lot of human actions, emotions and affairs, be it through numerology or tarot card reading, be it palmistry or onomastics (study of names). It has become an avenue for a very profitable business in today’s day and age. Just like astrologers provide good and beneficial tips for a healthy future and life, ReleaseMyAd provides some helpful tips for the best possible composition of your newspaper ad. 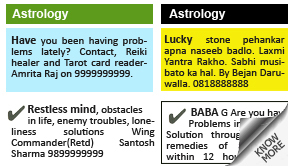 How to Book Astrology Advertisement In Newspapers? Begin booking your ad by choosing the ad type as Classified Text and then go on to choose your category as Astrology to start composing your run on line advert. You can simply specify the type of Astrology you are engaged in, like Numerology, Palmistry, Tarot Cards and you can also advertise your business of astrological stones with simple text ads. The next step is where you can compose and design your ad by typing your ad matter in the box and add necessary enhancements like ticks, screen borders or colors to adorn and differentiate it from other ads. ReleaseMyAd enables you to see how your ad will appear in a newspaper before publishing it with our unique Live Preview Ad Feature. To get an instant confirmation via email with all your booking details, please make sure that you confirm your release dates. Also ensure that you have cleared all your payments at least 2-3 days prior to the release dates. You can make all your payments through our secure online mediums such as via Debit/Credit Cards & Net Banking (All Indian Banks); or avail our offline payment mediums which include payment via Demand Drafts, Cheque Deposits and even Cash Collection from your doorstep. Inaugurate the booking of your newspaper ad by choosing the appropriate ad type ad Display Classified and go on to select the category as Astrology which will take you to the stage where you can compose your ad in your own way. The next stage provides you with a range of design templates and other decorative enhancements like changing background colors, uploading images and logos of your Astrology company or you can even upload astrological signs or zodiac signs. You can even format the text by changing the font style and size as well. Advertisers with extensive knowledge in the field of newspaper advertisement can upload their personally designed adverts through releaseMyAd. You can review your ad before publishing it with our Live Preview Ad Feature. The last stage requires you to confirm your ad release dates and clear your payment via our online (Credit/Debit Card & Net Banking) options or our offline (Demand Draft/Cheque Deposits and Cash Collection) mediums. At the end of all this you’ll receive an email confirmation with all your booking details in the form of an invoice.